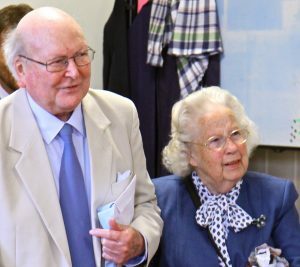 The Michael James Music Trust was established in 1981 by Raymond and Margaret James (pictured left) in memory of their son, the young organist and conductor Michael James BA, FRCO. Its mission is to discover, promote, educate and support gifted young musicians, and it has, for many years, funded places for one or two scholars at Laudemus!. Michael James was Assistant Director of Music at Canford School and Assistant Organist at Wimborne Minster. He was about to take up an appointment as assistant to Barry Ferguson at Rochester Cathedral when he was diagnosed with a brain tumour; Michael died in 1981. The Trust is now an independent flourishing national charity serving the community, and attracts an ever increasing number of patrons and followers throughout the county and beyond. Following the death of Raymond James in 2016, Margaret continues to administer the Trust with the help of fellow Trustees. The Trust makes annual awards to advance education in music, particularly music performed in a Christian setting for the enrichment of worship. Priority is given to young organists and choral scholars. When funds allow, other instrumentalists may be considered, but grants cannot be awarded for the purchase of instruments. The trustees can be contacted in writing at the address below.